Menelaus was a member of the cursed House of Atreus, born of the line of Tantalus, with his father named as King Atreus of Mycenae, and his mother, Aerope, granddaughter of King Minos. ​Menelaus was of course also brother to the famous king, Agamemnon. ​Menelaus and Agamemnon would firstly find sanctuary in Sicyon, in the court of King Polyphodes, and then the brothers travelled onwards to Calydon and the court of King Oeneus. In Calydon, Menelaus and Agamemnon started to plan their return to Mycenae, and from Calydon, the pair would travel to Sparta to enlist the help of the most powerful king of the day, Tyndareus. Tyndareus had a second "daughter", Helen, and Menelaus had his heart set on marrying her, but Helen was the most beautiful and eligible woman of the age, she was after all the offspring of Zeus, born to Leda. 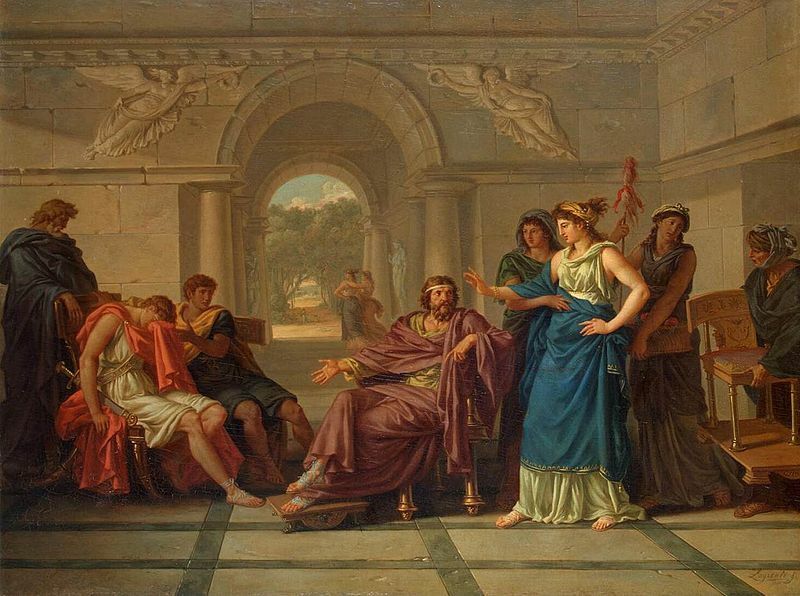 It was then that Odysseus was said to have come up with the idea of the Oath of Tyndareus, where each Suitor of Helen would agree to protect and defend the chosen husband of Helen. ​No suitor would dare break their oath, and so violence then and in the future could be avoided. When all the suitors agreed to be bound by the Oath of Tyndareus, the Spartan king then chose Menelaus to be husband of Helen. Sparta prospered under Menelaus, but there was intrigue afoot in the realm of the gods, and during the judgement of goddesses’ beauty by Paris, Aphrodite would bribe the Trojan prince. Aphrodite promised Paris the hand of the most beautiful mortal alive, Helen, ignoring the fact that Helen was already wed to Menelaus. Eventually, Paris came to Sparta, and was welcomed into Menelaus’ palace, the Spartan king being unaware of the Trojan’s plans. Whilst Menelaus was absent from Sparta, attending the funeral of Catreus, Paris acted, removing Helen, either by force, or else Helen went willingly, and a large amount of Spartan treasure. The common story then tells of how Menelaus invoked the Oath of Tyndareus to bring forth the former Suitors of Helen, in order that Menelaus could retrieve his wife; and so 1000 ships were launched against Troy. ​Menelaus would lead 60 ships of Lacedaemonians from Sparta and surrounding cities. For a favourable wind though, Agamemnon was advised that he would have to sacrifice his daughter, Iphigenia; and Menelaus eager to set sail, cajoled his brother into undertaking the sacrifice; although Iphigenia was probably rescued by the gods before she was killed. 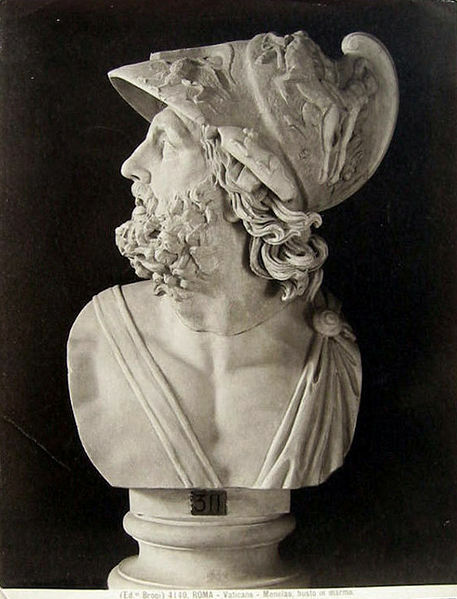 During the war Menelaus was protected by the goddesses Hera and Athena, and although not amongst the greatest of Greek fighters, Menelaus was said to have killed 7 named Trojan heroes, including Dolops and Podes. Menelaus was also said to have been one of the Greek heroes, alongside the Aiantes and Meriones, who retrieved the body of Patroclus when he had fallen during battle. During the war Menelaus is most famous for his combat with Paris, a fight that came late in the war; this fight was arranged in the hope that the war could be brought to an end. Just as Menelaus got into position to achieve a killing blow, the goddess Aphrodite intervened. 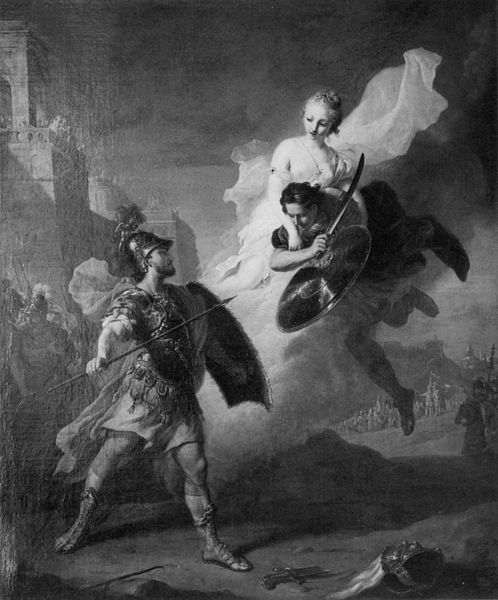 Paris was Aphrodite’s favourite, and first the goddess broke Menelaus’ hold upon his opponent, and then shielded him in mist until he was back behind the walls of Troy. The Trojan War would only eventually end when the ruse of the Wooden Horse was implemented; and Menelaus was named amongst the heroes who entered the belly of the Trojan Horse, and led the Sack of Troy. During the pillage of Troy, Menelaus sought out Helen, and located her in the company of Deiphobus, a son of Priam, who had been given Helen as a bride for his role in the defence of Troy. Helen was said to have signalled to Menelaus to tell him where she was to be found. In Sparta, Menelaus and Helen were reunited with their daughter Hermione, but they were soon separated again for Menelaus had promised the hand of Hermione to Neoptolemus, the son of Achilles. Unfortunately, Menelaus had also promised his nephew Orestes that he would marry Hermione, although Orestes was at the time in no state to marry anyone; Orestes being harassed by the Erinyes for the murder of Clytemnestra.